Waldeinsamkeit | or, "the feeling of being alone in the woods"
Today was an easy day – Karma even called it Nepali Down* – sleeping in late and reading in bed until after 7 am! 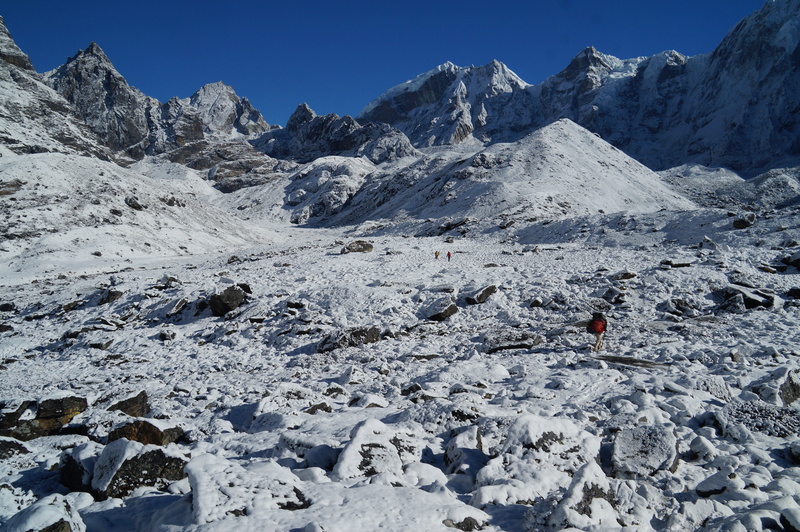 We made our way out of Dragnag and up to the Ngozumpa Glacier. 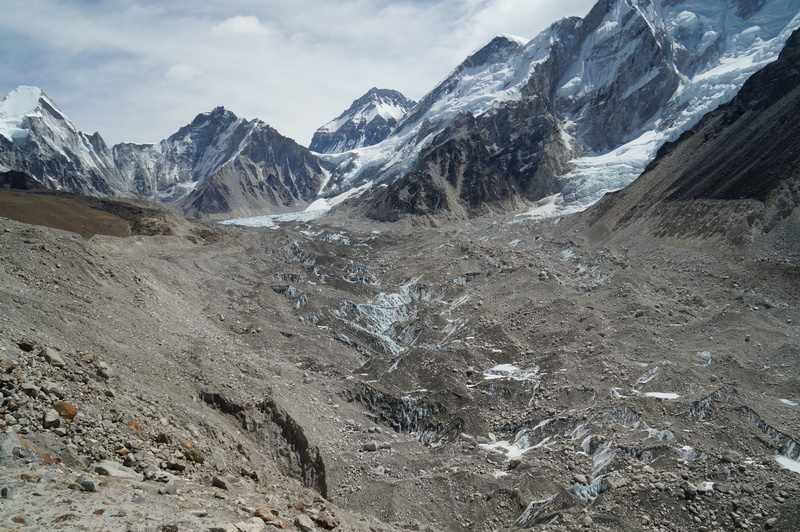 It was stunning, even though it is covered in debris (a whole lot of supraglacial moraine?). 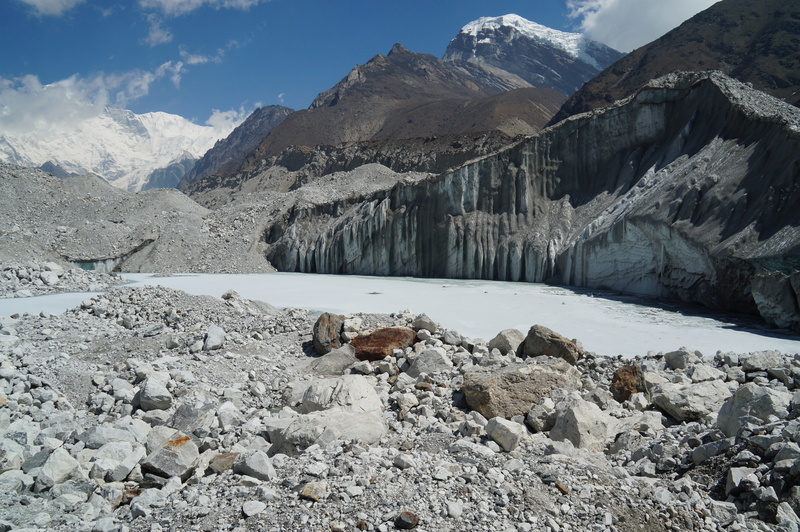 Very similar to the Khumbu glacier. As we approached, Karma constantly watched the lateral moraine piles for potential rock falls. Fortunately, there were none, but it was enough to keep me on my toes and moving as fast as my body would manage. Now we were on top of the glacier, picking our way across and stopping often to enjoy the views. Hard to believe – but that’s all glacier. About 2/3 of the way across, we encountered a traffic jam climbing down a rocky section – over a dozen trekkers insistent that they go up even though we started down first. It was a reminder of how happy we are to have done a small, private trek rather than be part of a large group. Folks were rude and it seemed like much less fun. 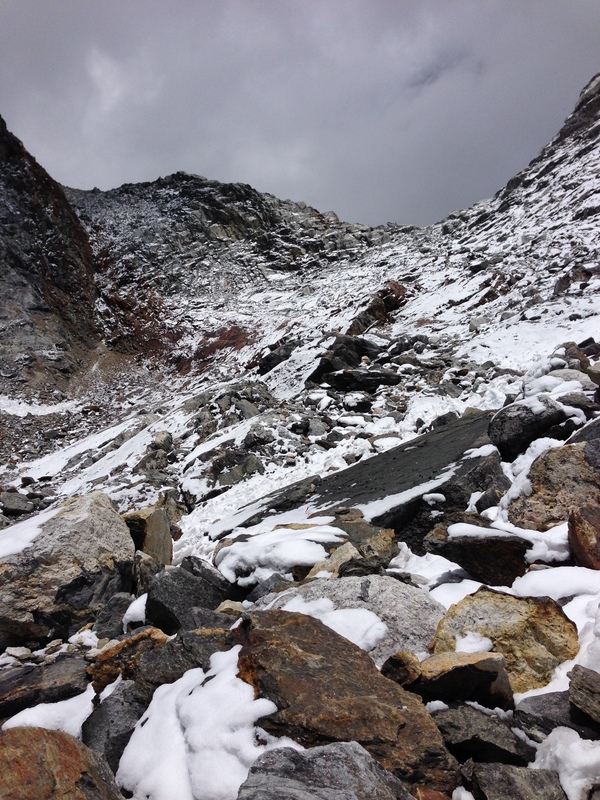 Two and a half hours (and one close call with a wind-induced rock fall) later we arrived in Gokyo. 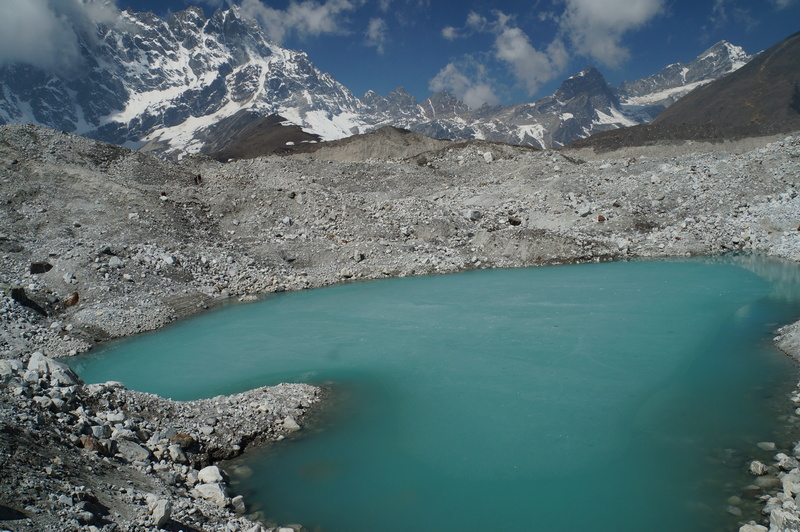 Every day has brought new views on this trek, but this is our first real exposure to Himalayan lakes. 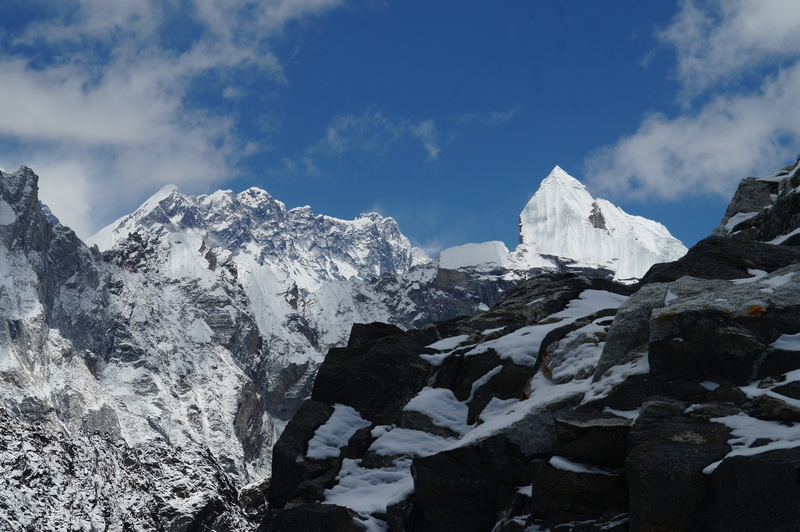 Gokyo is stunning – windy and the clouds rolled in quickly, but we couldn’t bring ourselves to stay inside. 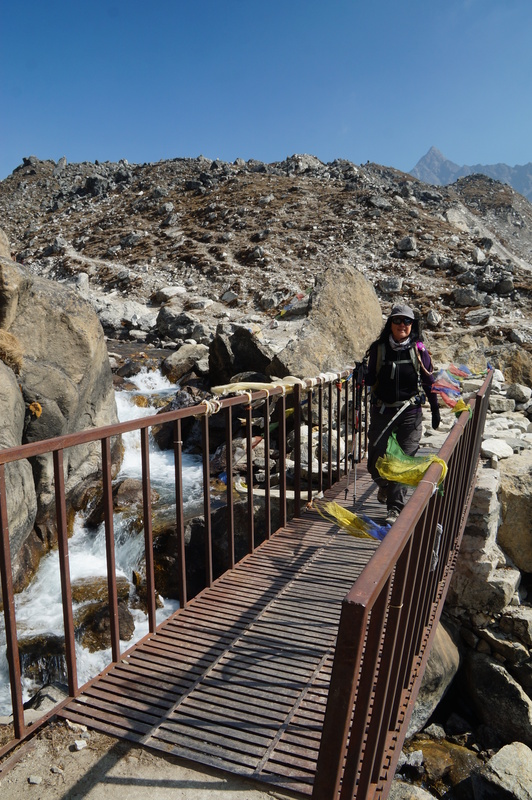 Instead, we meandered along the base of Gokyo Ri until we reached the far side of the lake. Our post-lunch stroll was a nice excursion in an overall lazy day. After two 10+ hour days in a row (and the 3rd day wasn’t much shorter) we deserved it. With the clouds blanketing everything I couldn’t justify the slog up Gokyo Ri, imagining that at 5360 m it would be just as miserable as Kala Patthar. Having only just started to recover, it didn’t seem wise to make the trek at sunrise either. It will go unclimbed, and give me a good reason to come back to this corner of the world. So maybe this hasn’t been my best day on the trail. 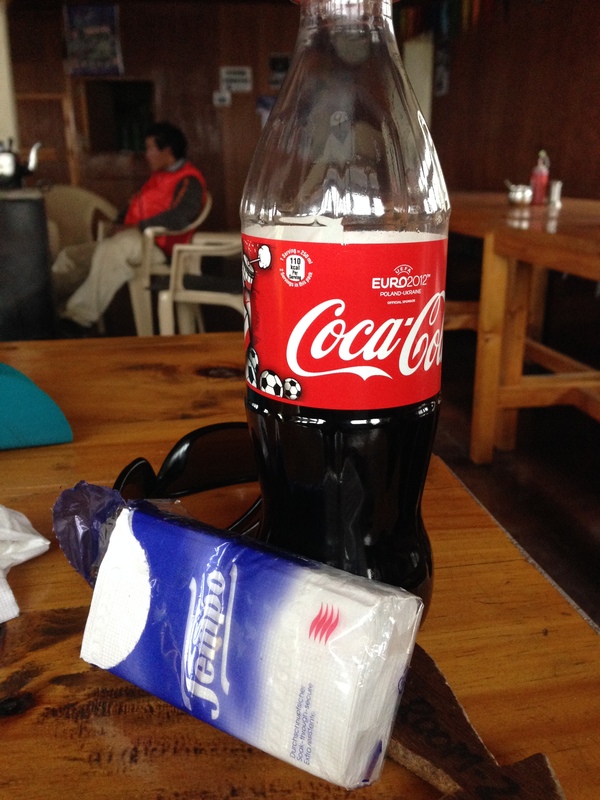 In fact, this was by far the toughest day of the trek for me. The first inauspicious sign of the day was waking up with my throat so sore it would hardly open and I could barely speak. I ordered a hot lemon with honey – great for the throat, but leaving me a bit lagging without my morning shot of caffeine. 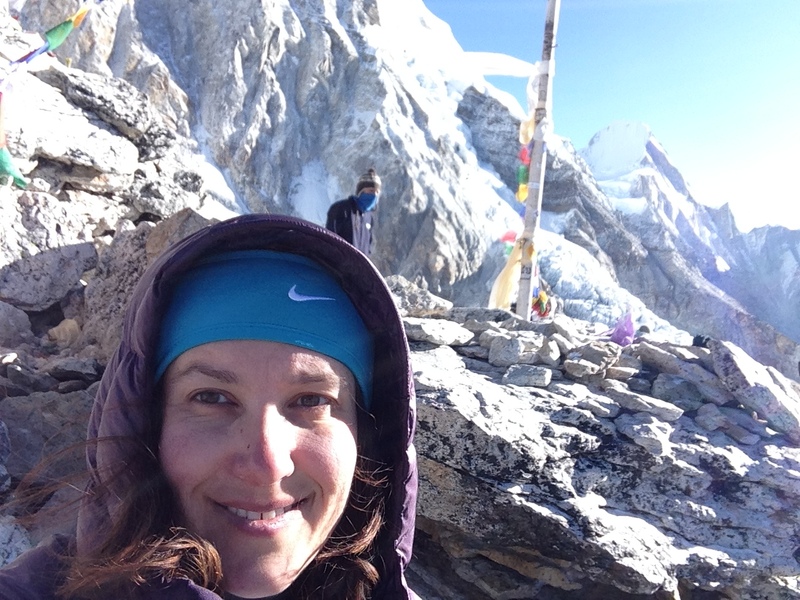 I tried to put on a good face as we set off for the Cho La pass at 6:45 am. The first few hours were tough but manageable. We started bundled for the cold – snow had covered everything the night before, creating a white wonderland for us to cross. The downside was that as the sun got higher, the reflection from the snow got hot quickly. Before I knew it we were desperate to shed layers. Knowing it would be a tough day, Karma took our jackets from us. He had already been carrying all of our water. Soon we were heading up, up, up – not an unreasonable trail, and if I had not been so sick it would have been perfectly reasonable. I might have been able to enjoy it more! Still happy – no real climbing yet! Next was a long scramble up the rocks to the edge of the glacier. I tried not to think about all the “Caution. Rock Fall” warnings on my map. By this point I was struggling, and Karma took my bag from me. That helped. I still made him nervous using my hands on the rocks to help me. Constant caution not to press on anything too hard and start a rock fall. 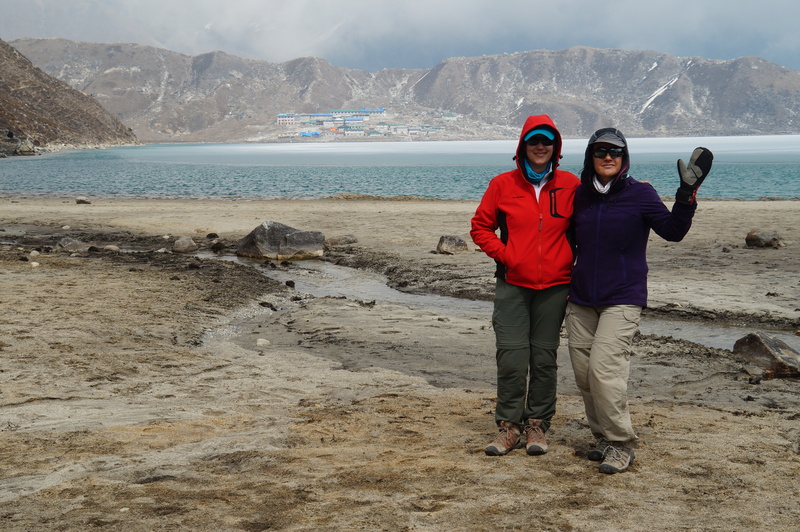 Karma and Mingma – in much better shape than me – started a bag shuttle up the mountain. First our duffles, then the day packs, then us if we needed it. We repeated this until everything arrived at the top. Headed up to the glacier. Next was the glacier crossing. 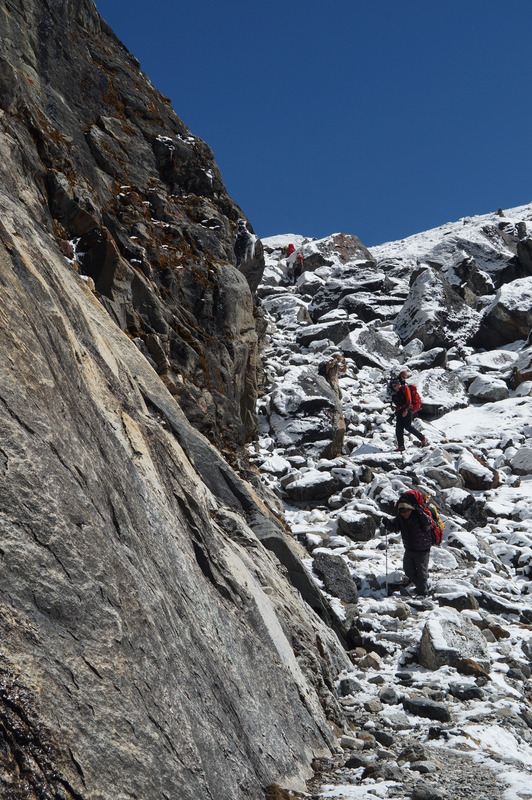 This required carefully kicking steps into a steep snow slope and picking our way across – hugging the mountain wall and taking care not to slide down. This was the first time I felt at home – 22 years of Upstate New York winters made me far more comfortable in slushy deep snow than I am on the rocks. 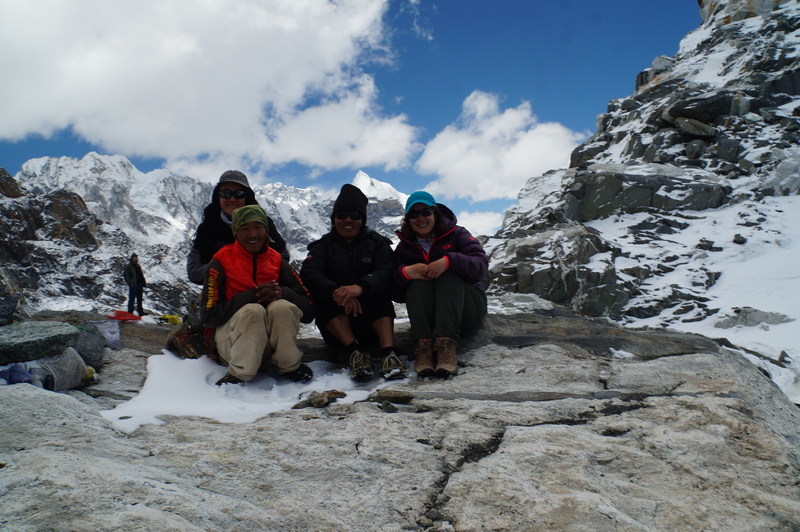 After a last traverse of a snow field on the glacier and a quick scramble we were on top of Cho La Pass. 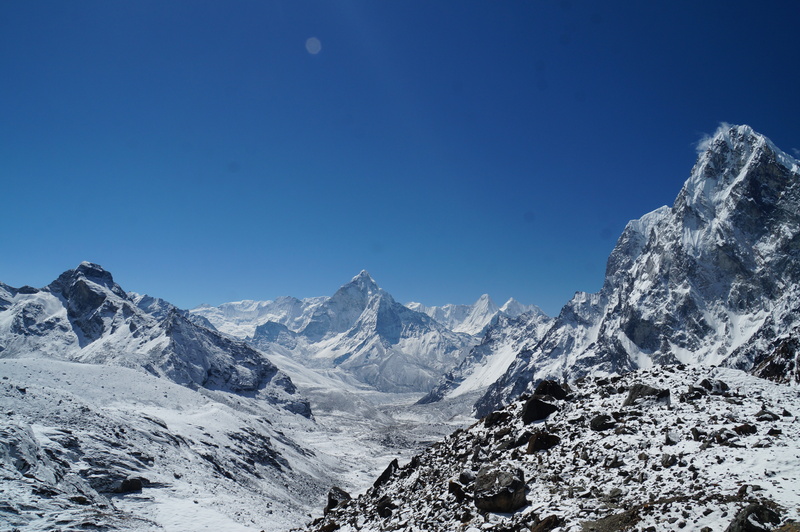 The views were magnificent – better than Kala Patthar (although with less Everest). From our perch at 5420 m we could see the clouds starting to form. The toughest part was still ahead of us. Caren, Karma, Mingma and I on top! 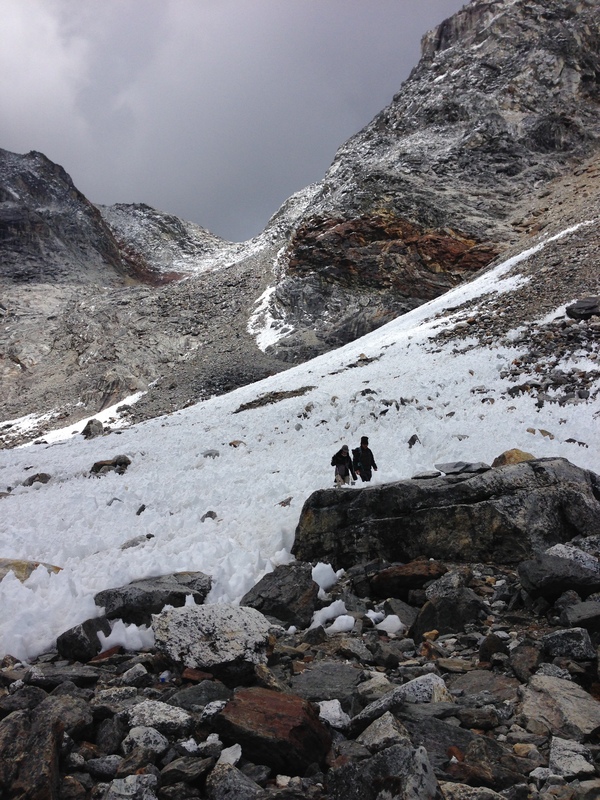 We arranged a similar person/bag shuttle down from the pass, picking our way through a precarious and snowy rock field. Down is far more nerve-wracking for me, and I had plenty of adrenaline surge to keep me going. 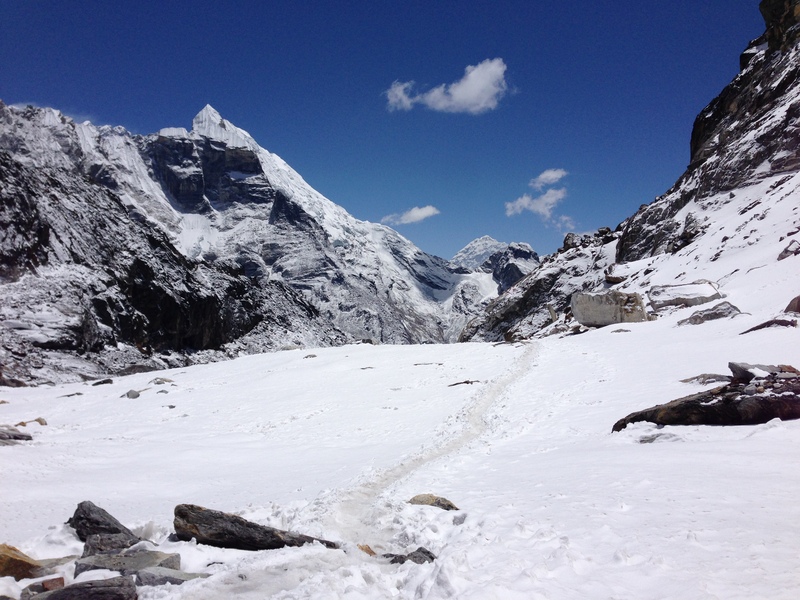 Life got easier as we reached the final snow field that stood between us and the lunch our hosts in Dzonglha packed. Caren crossing the snow field. Having survived with only one rock fall (and no injuries) and across the snow field, we found ourselves on a hilly moraine. We stopped for lunch at a frequent campsite location and enjoyed our still warm boiled eggs, potatoes, apples and juice. From there we followed a drainage down and down until we reached Dragnag. My cold was much worse, and the lack of caffeine was taking its toll. My body shut down into what I refer to as “zombie mode” – one foot in front of the other and as few stops as possible, just wanting to survive the rest of the journey. All I could think of was a warm fire, a bottle of coca cola, and tissues. On arrival (10 hours after we started) I splurged on just that. 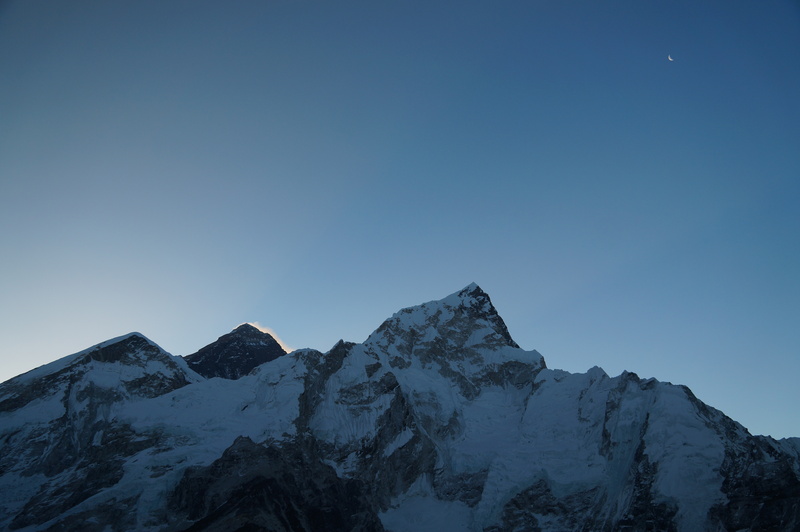 When the alarm went off at 4 am I spent a full 5 minutes laying in bed and debating how badly I wanted to climb Kala Patthar. Wes didn’t give me a choice, dragging me out of my warm cocoon against my will. Caren won her fight with Tom though and stayed behind sick. The boys set off in the dark at such I pace that I was fully winded before taking a single step uphill. As soon as we did, Tom dubbed the climb the “Nepali Iron Mountain,” and I knoew I was in for a long and painful uphill. Iron Mountain (in LA) features a series of steep climbs, culminating in a summit push of about 2,000 feet of vertical gain in the final mile. For this I had a little over 400m (1312 ft) in about 2 miles. Not nearly as bad, but still very steep for the first half of the climb. And of course, you have to factor in starting around 16,800 feet! It was also pre-sunrise and ice cold. I had bought a heavy down jacket a few months ago and barely used it on the trek. Today I decided it was an amazing purchase – keeping me toasty throughout both the ascent and descent. My mittens, however, need an upgrade, forcing me to shove my hands under my arms periodically to thaw them. My camera batteries were tucked inside my parka to preserve warmth and life. 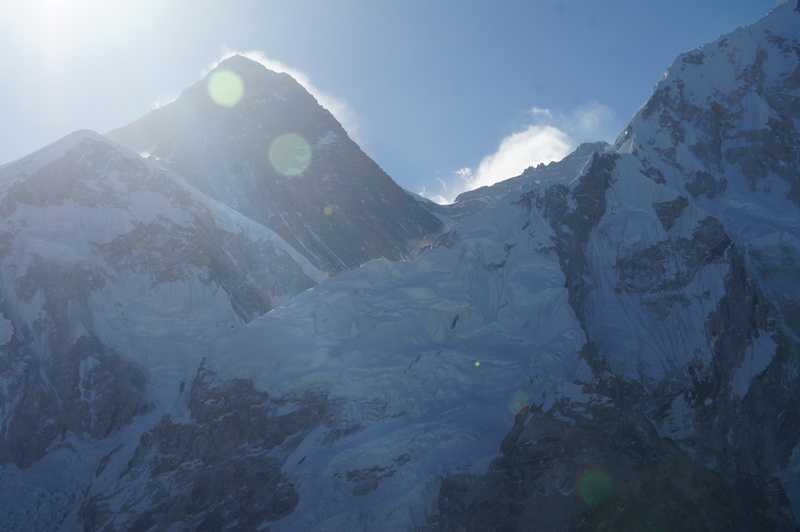 About halfway up, my willpower waning, the sun lit up the back of Everest. Wes, Karma, Mingma and I stopped for some hot ginger tea (thanks Mingma for carrying it!). We felt bad for poor Tom, probably already on top, and sent the rest up to him with Mingma. 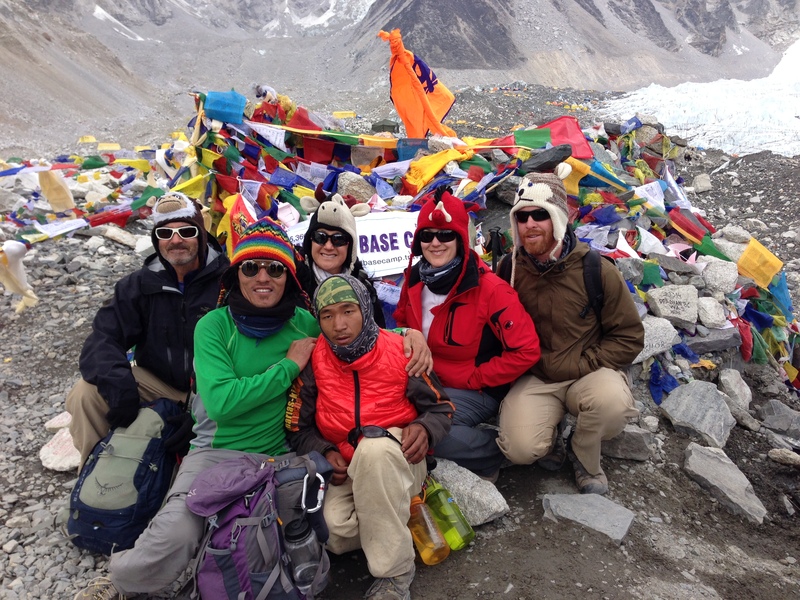 A grueling 2 plus hours later, Wes, Karma and I finally joined Tom and Mingma on top. 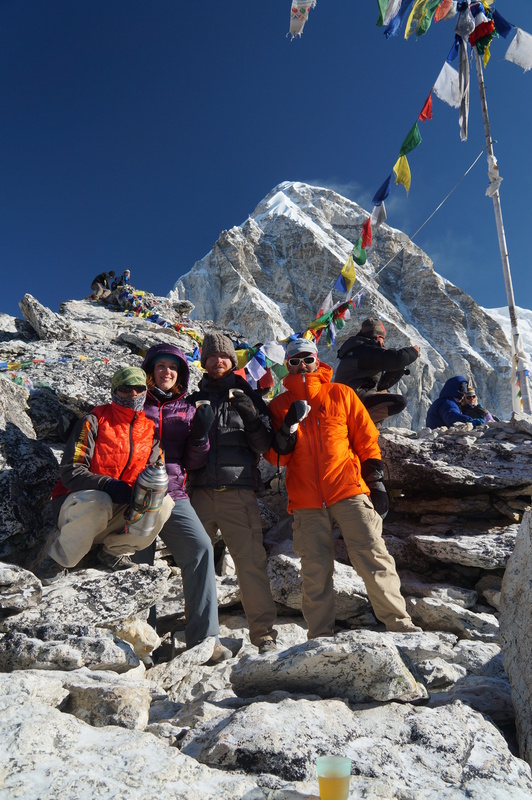 Finally on top of Kala Patthar! By the time we arrived the sun had risen just high enough to ruin the views. We toasted with the remaining ginger tea, snapped a few obligatory shots, and made our way back down to breakfast. The path was full of loose stones and very slippery from the frost. Not fun for my knees – I hyperextended the right one while slipping on some pebbles. But nothing that would cause permanent damage. Breakfast was beyond tasty after 4 hours of morning exertion. It was hard to believe though that this meant our day was just starting. 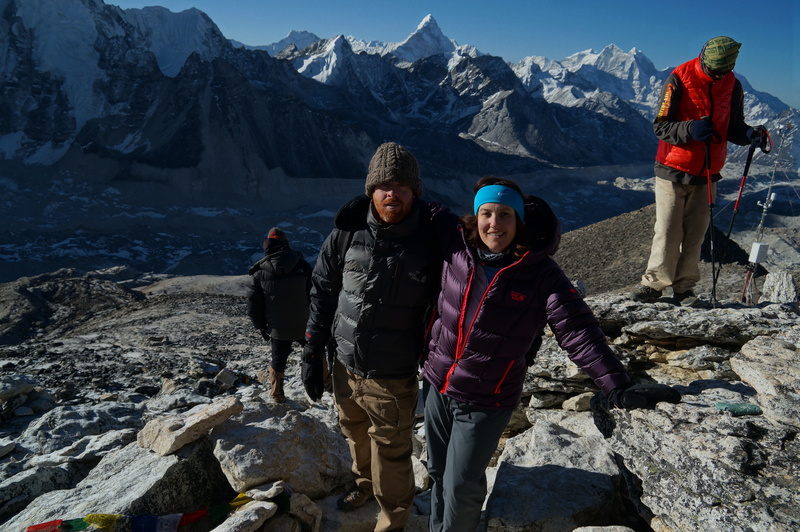 We packed up and set off for tea/snacks/lunch in Lobuche before parting ways with Wes, Tom and Raz about a km past the town. It was hard to say goodbye for a few days, and I’m sure I will worry about their Island Peak climb. 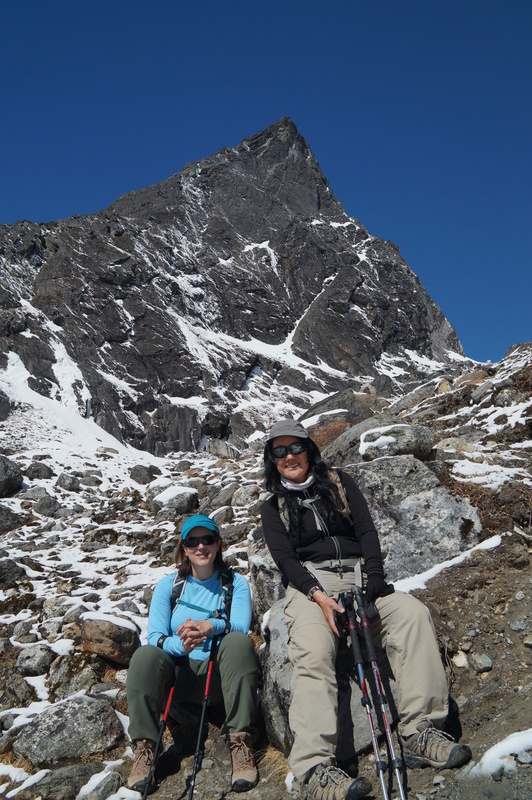 Caren and I wound our way into the Cho La valley along a Nepali flat contour, sometimes with extremely steep drop offs. But the views were spectacular. It turns out though that I was too tired for pictures, and I’m left with just the mental images – harder to share. 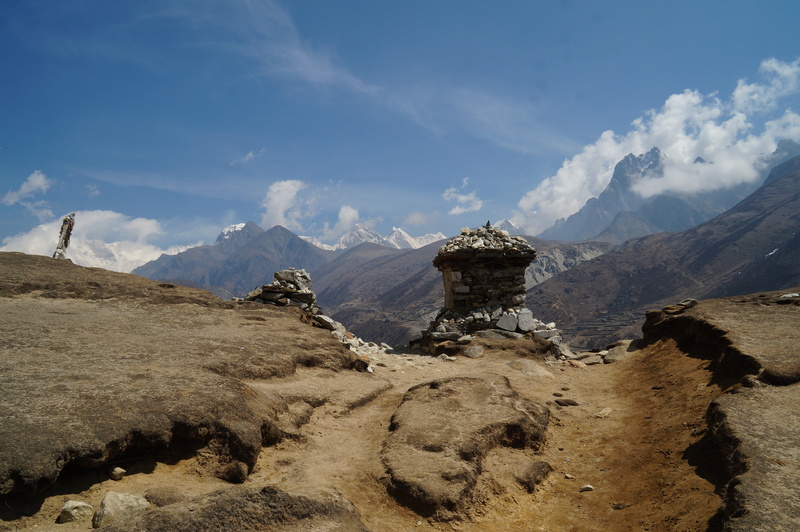 From Lobuche we wound our way around Awi Peak. We could see the Stone Memorials from our trek in (and, we think, Wes, Tom and Raz) as we split off and started to make the turn. 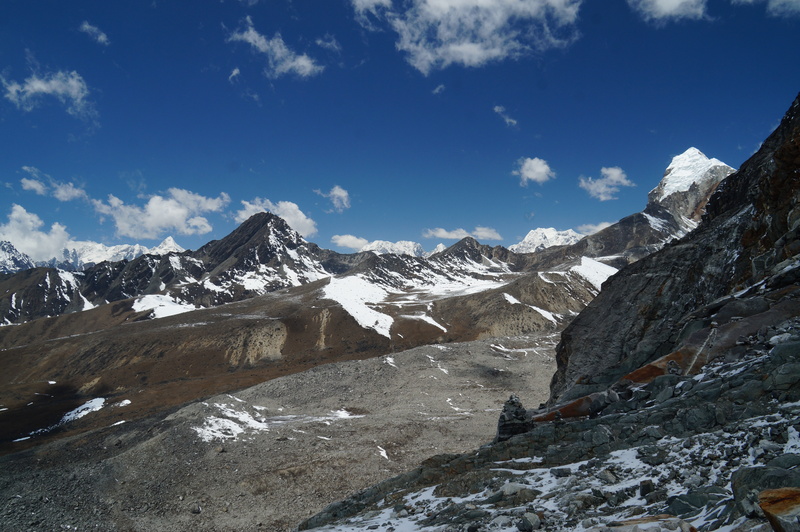 Looking out into the valley was Chola Tsho Lake and the Chola Glacier below Taboche Peak. 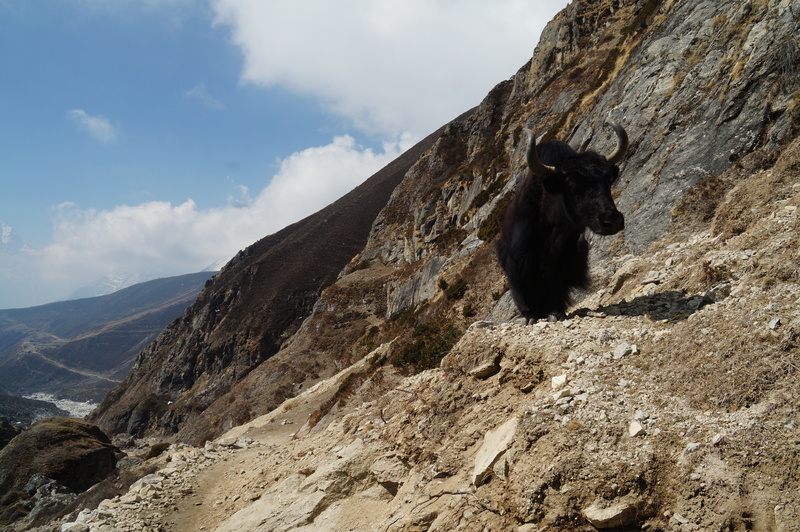 As we approached Dzonglha we started to climb through some mist, emerging at the top of a flat area and our lodging. Evening in Dzonglha brought thunder, lightening, and a snowstorm that blanketed everything in white. Today was a long day. We befriended a trio from New Zealand/Australia/Great Britain at breakfast who we had seen a few times before. I would be surprised by how few friends we’ve made, but we don’t often travel with other couples. It’s made us pretty insulated, and it’s nice to meet people who we have seen throughout the trip. 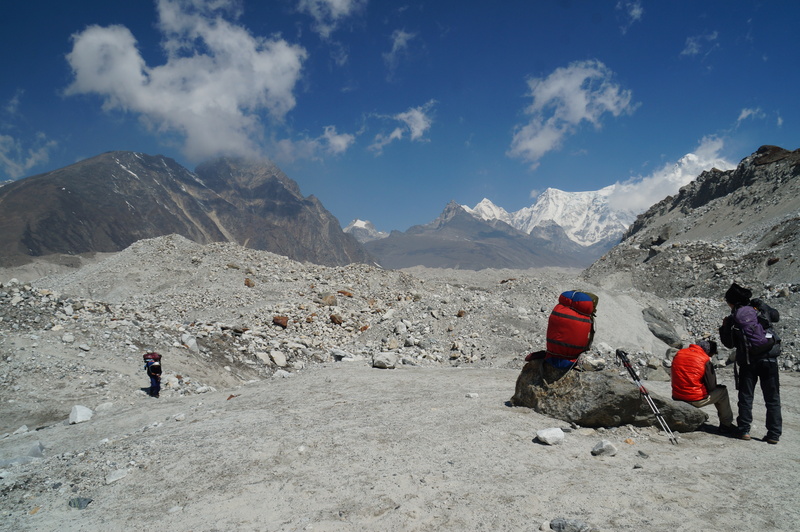 A couple of hours of Nepali flat later we arrived in Gorak Shep – about an hour later than we anticipated. Most of us have some sort of ailment now. This morning it was nausea for me. Probably from not realizing the momos are as poisonous to me as the flour in the soup. I can’t seem to catch a break on food here! Karma spoils me at least – always negotiating ingredients with the kitchen. I don’t know how a celiac would survive here. 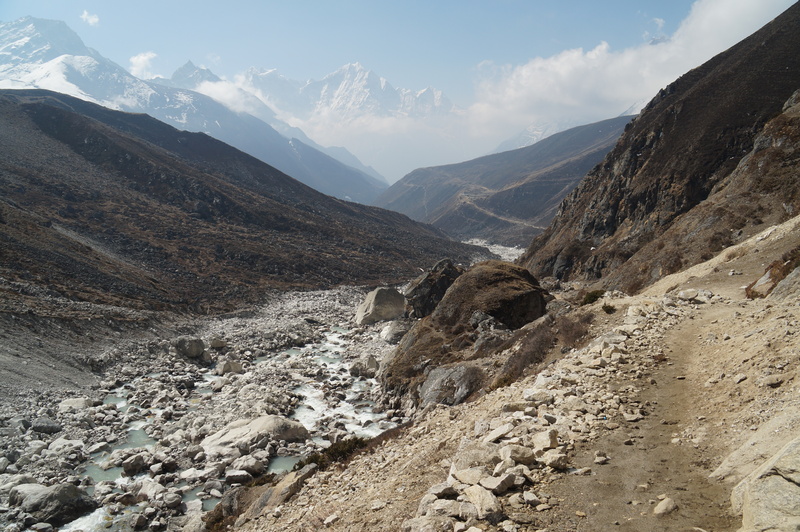 Our walk today followed the long tongue of the Khumbu glacier. It’s hard to see the ice beneath the debris for most of the walk, but we finally can spot blue among the crevasses. 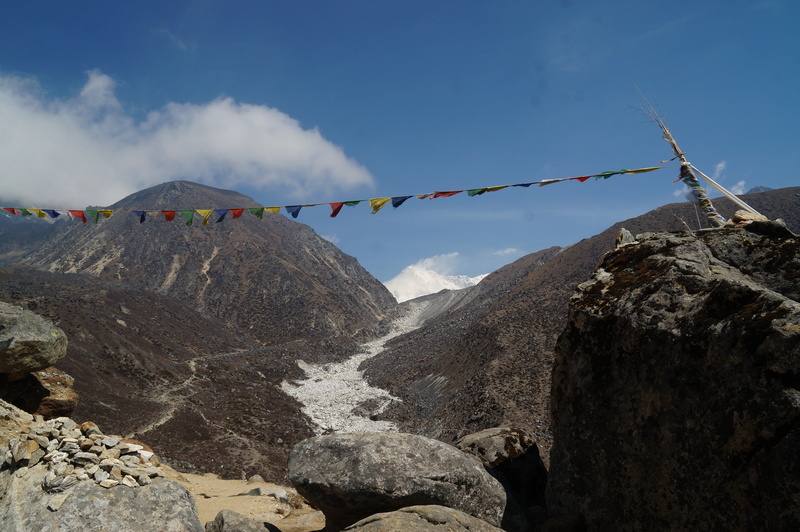 The glacier separates us from the tall wall of Nuptse and we hike along under the shadow of Lobuche. The elevation is now over 16,000 feet. It’s hard to move at anything faster than a shuffle. 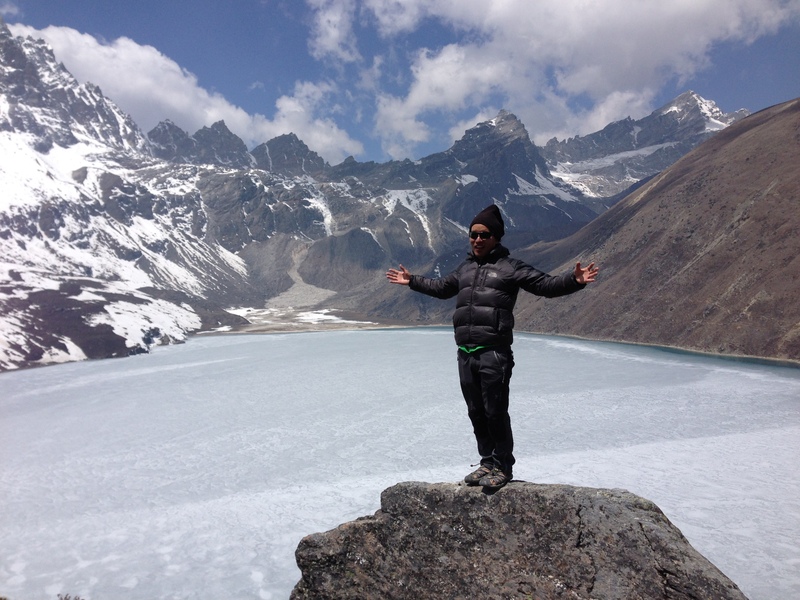 After lunch in Gorak Shep we piled on the layers and set off for more Nepali flat on the way to Everest Base Camp. 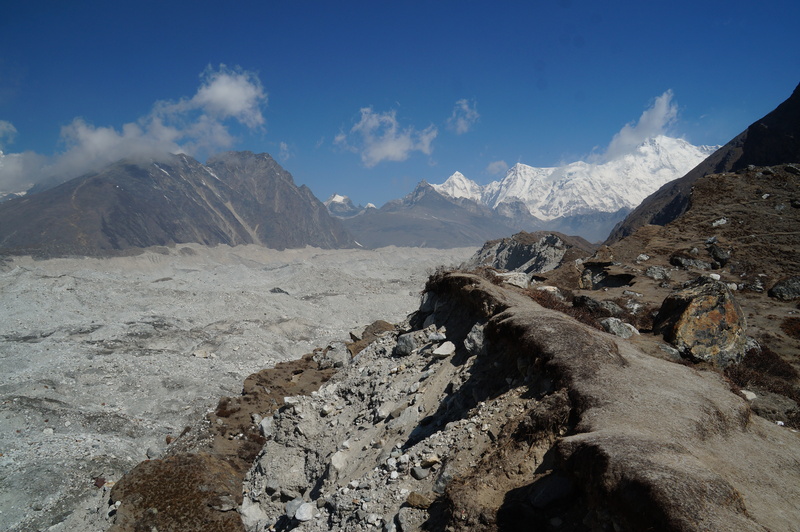 Most of the trek involved rambling over either moraine debris or actual glacier – an uneven and rocky mess. It was also insanely crowded. 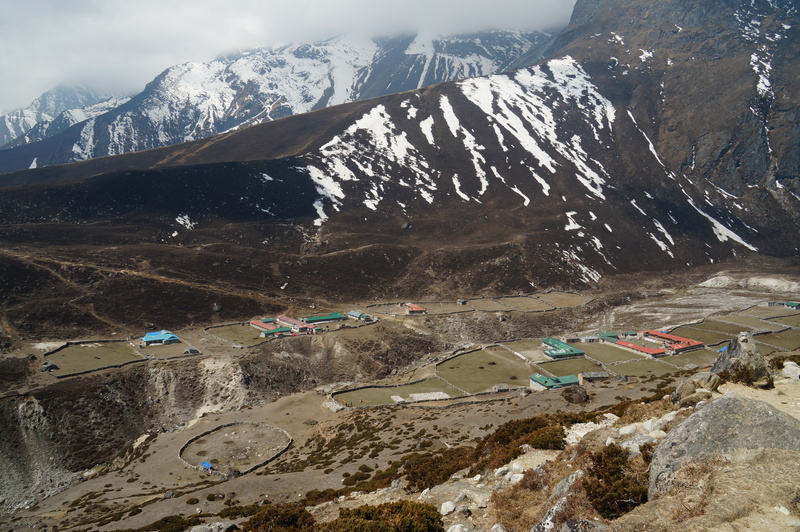 We had braved the Namche superhighway through most of the trip, but the final mile was jammed with trekkers. 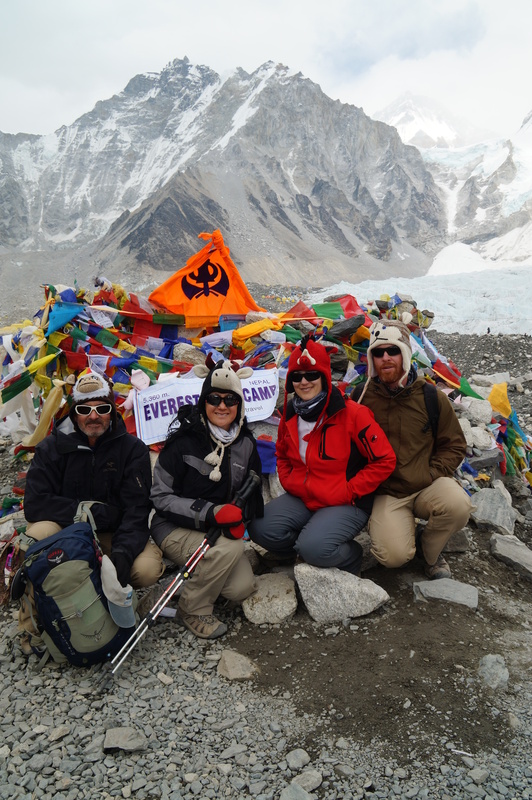 By the time we arrived at EBC (per trekker slang) we had to wait what seemed like an eternity to take a picture in front of the sign. Even Mingma jumped in the picture though. Raz had stayed behind, and was missed. 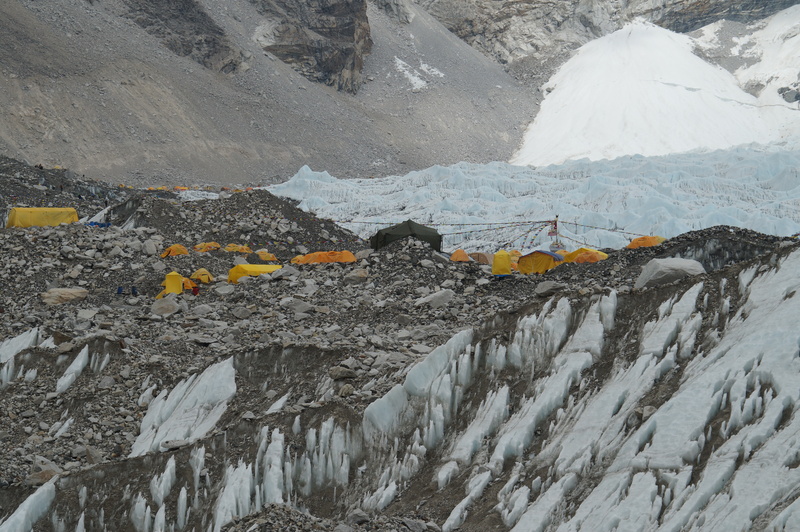 EBC is a collection of yellow tents (easier to find after a snowstorm) sprawled across the glacier below the Khumbu Ice Fall. 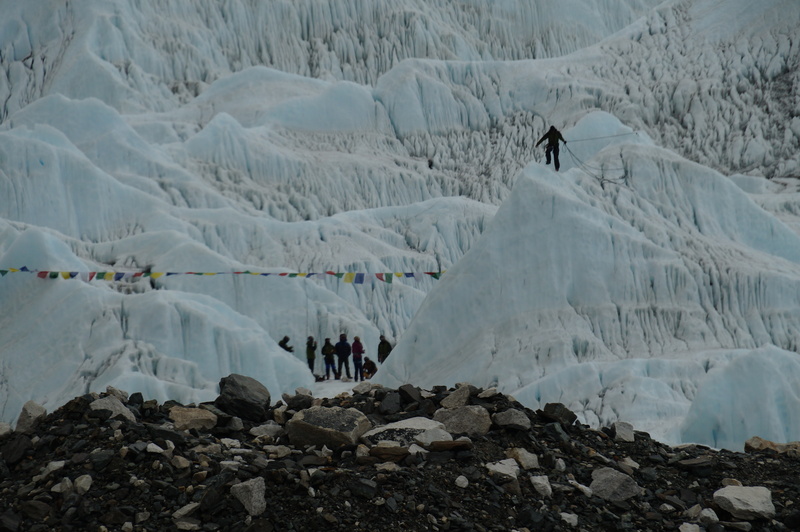 We could see climbers fixing ropes in the Ice Fall – it didn’t look fun. 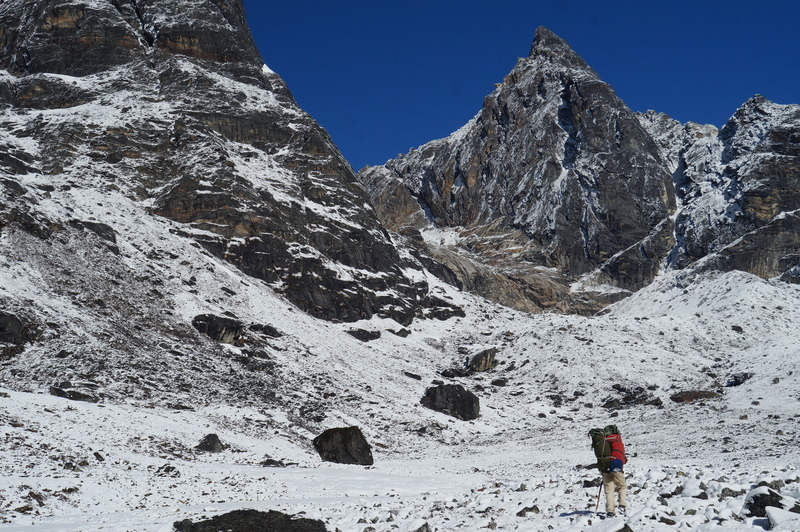 We also saw a steady stream of sherpas hauling gear out of EBC and back toward Namche. Some were marked with the Discovery Logo – the wing suit jumper they were there to film was forced to abort after the avalanche tragedy. 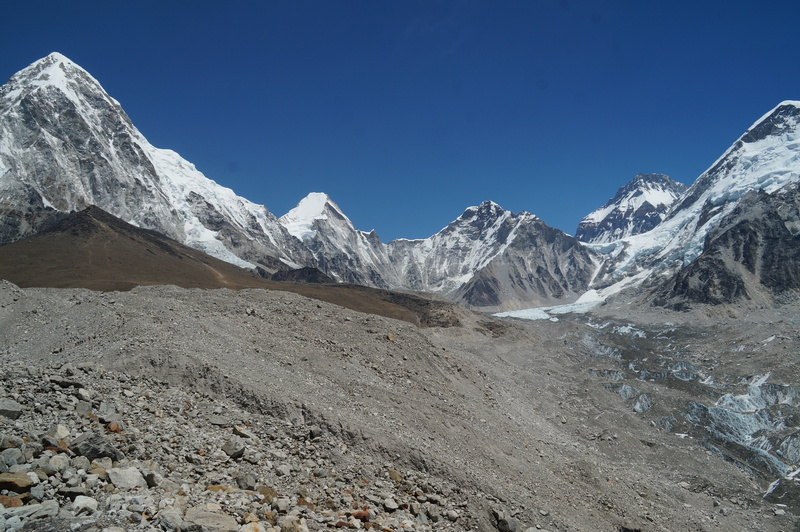 Despite guidebooks which warned otherwise, from certain angles you can see Everest peaking over the NW shoulder. 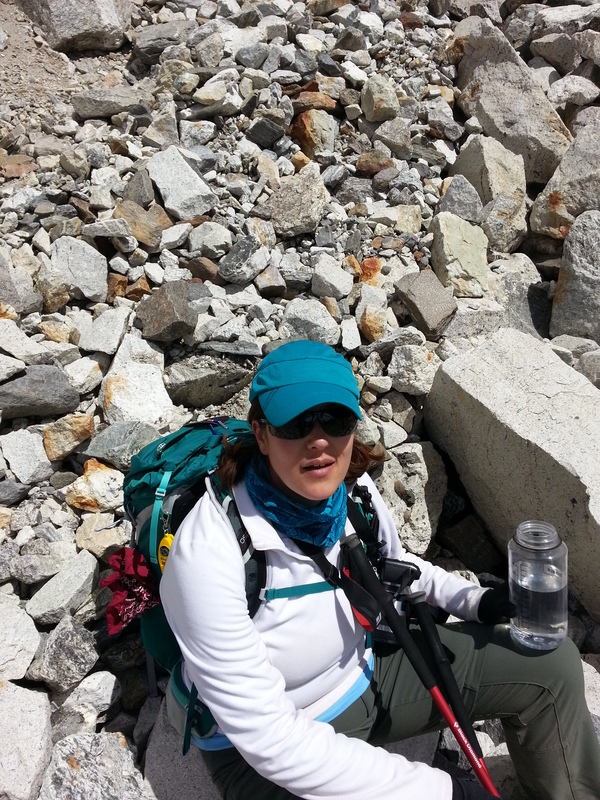 Everything about the climb looked difficult and unpleasant. So far I have no idea why people see it and want to get to the top. 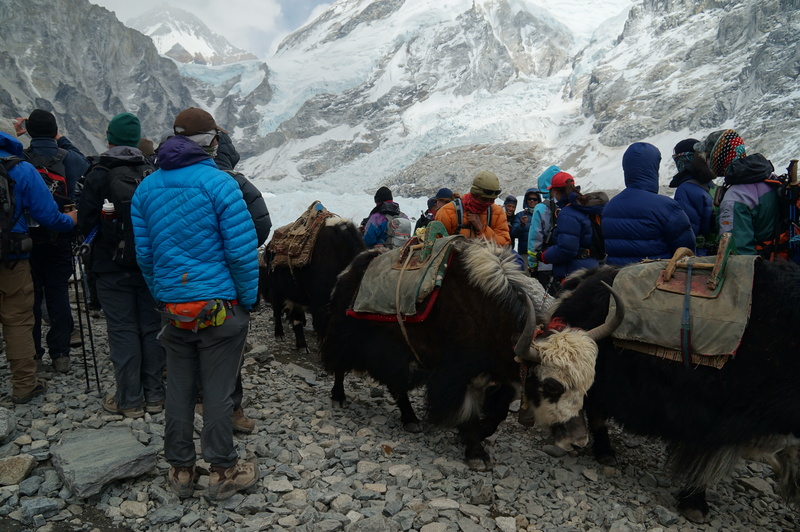 At this point, a combo of crowds, yaks and rapidly deteriorating weather (and oh fine, fatigue) convinced us we should turn around and head back to Gorak Shep. On the way back the momos won. 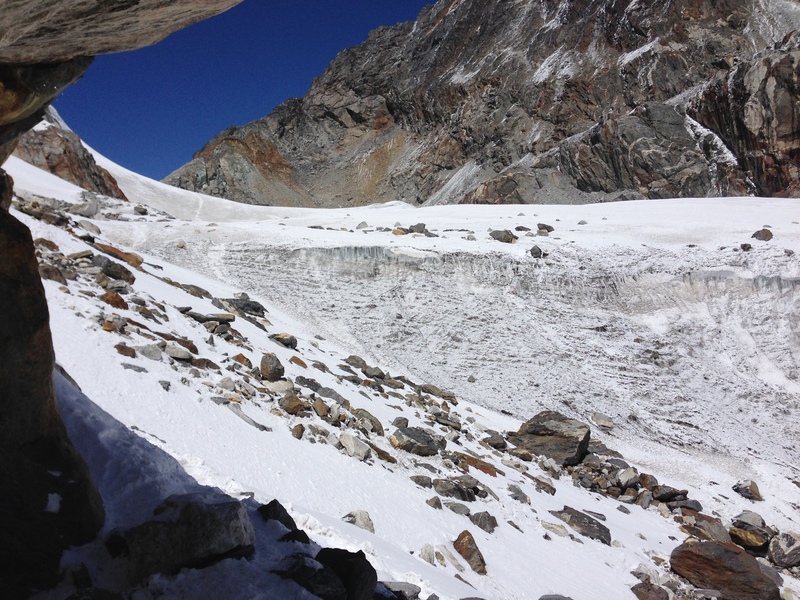 Nothing like welcoming your first snowfall in Nepal huddled behind a rock that’s hanging over a glacier. At least it was scenic? 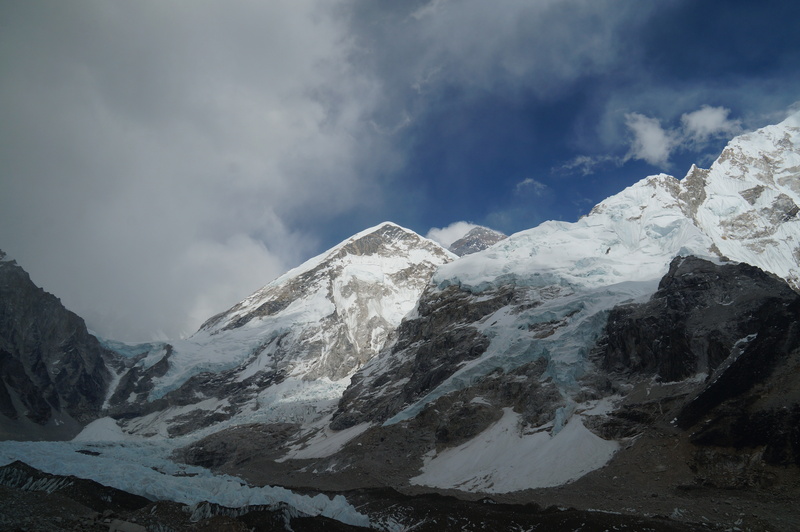 As we passed by more Discovery and NBC equipment, we witnessed a small avalanche on Nuptse. 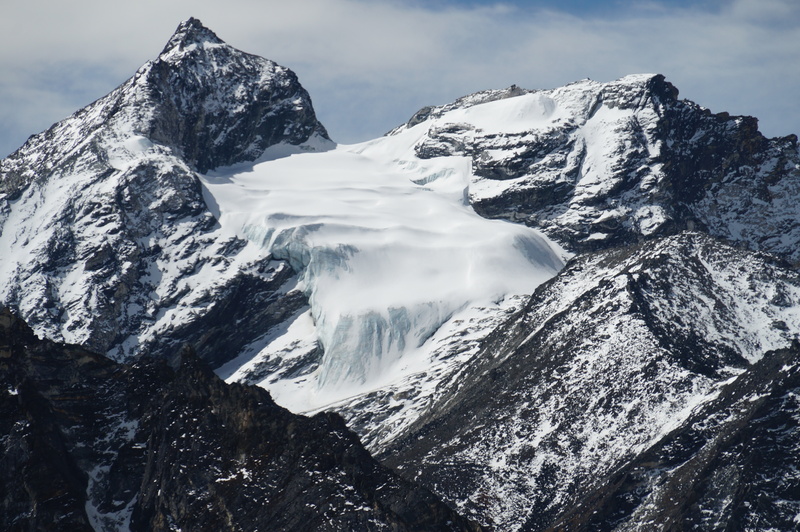 At dinner we spotted a much larger avalanche on Nuptse – visible through the window in the dining room. It seemed to validate the decision to abandon the climbing season. 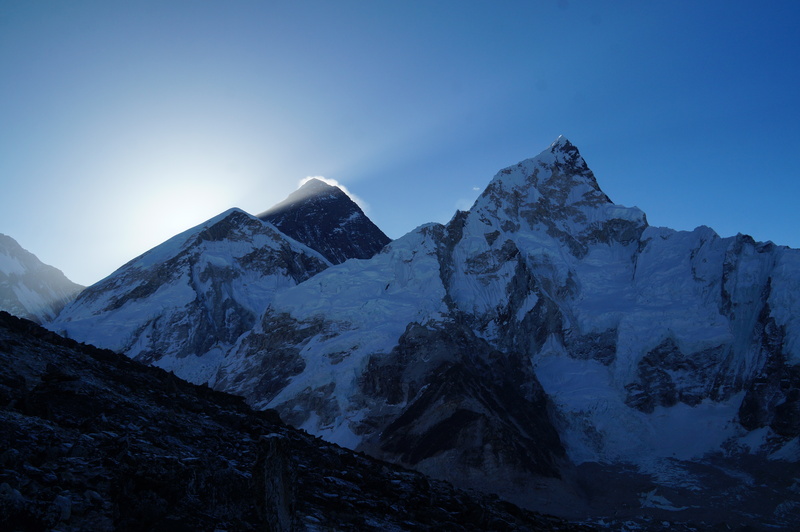 Early to bed tonight – we have a 4 am wakeup to climb Kala Patthar in the morning!